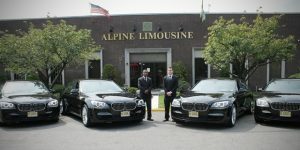 Alpine Chooses 7 Series BMWs for Fleet Addition | Alpine Limousine Service, Inc.
“For my type of upscale clients, the BMW was an exotic, luxury vehicle that they could appreciate,” he says about his corporate and VIP clientele. “With these cars, you don’t feel the road or the potholes like you would with other sedans. They are safe, luxurious, and classic; they’re a good car to operate.” He purchased 15 and they have been a part of his fleet for about a month now. The 740 Li is the extended wheelbase version of the 7 Series, and features 44.3” of leg room in the rear for the ultimate in comfort—the best of all of its sedans. Alpine’s vehicles are also xDrive, BMW’s version of all-wheel drive, which Avishay says will come in handy during the snowy Northeast winters. The cargo space is on par with most of the industry sedans at 17.7 cubic feet, while the fuel efficiency is 19 (city) and 28 (highway). BMW also offers an extended service plan, which brings the warranty to 3 years or 150,000 miles. Avishay also says that using the BMWs for affiliate work has been a boost to Alpine because customers and affiliates alike love the vehicles—mostly because they aren’t expecting such a lavish sedan. He says that he’s been able to maintain his rates, even though purchasing 15 vehicles was a sizable investment. He worked with BMW Key Account Manager Marco Schneider to find a price point that made the additional vehicles affordable, including special fleet rates and an additional incentive for making a volume purchase. Based on the positive response he’s received so far, he definitely plans on adding more in the future.